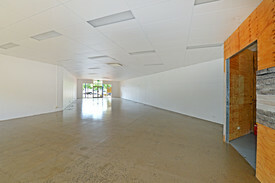 86 Commercial Real Estate & Properties in Noosaville are listed in 6 categories. We have 45 Industrial Warehouses Sale & Lease , 17 OfficesSale & Lease , 13 Retail ShopsSale & Lease , 5 Development LandsSale & Lease , 4 Medical and Consulting PropertiesSale & Lease and 2 Hotels and LeisureSale & Lease . Noosa Commercial Kitchen Plus Offices $1,300,000 + GST (if appl..
An opportunity exists for an owner occupier or investor to purchase this high quality industrial unit with commercial kitchen, cafe and offices. Commercial kitchen facilities in Noosa are rare and sought after, especially of this size and quality. 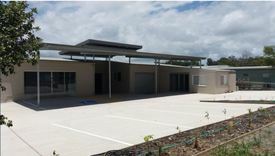 This facility comprises a full manufacturing / dispatch style of operation, with the approval to also run a cafe, servicing the busy Noosaville industrial precinct. Additional features include: + Fit out Approved commercial kitchen + Carpeted, air conditioned first floor offices + Caretakers residence approval + Mezzanine approval + Internal WC/shower + Approval for additional toilet facility, enabling the property to be leased to two separate tenants + Cafe, restaurant, retail business approval including internal and external dining + Two exclusive use car parks + High clearance roller door access and glass pedestrian entry + High quality kitchen fit out including two room coldroom, exhaust hood, stainless steel benches, pass through dishwasher + Grease trap and gas connection Call or email Louisa Blennerhassett or Paul Butler to inspect the property or find out about other suitable options. Our team is strategically located in two offices across the Sunshine Coast region and is ready to handle your commercial, industrial and retail property needs today so call or email now. Situated within close proximity to the well known Eenie Creek Road, this conveniently situated and versatile space offers ease of access to the Sunshine Motorway. With the building currently being renovated and the ability to adjust to suit your requirements, the savvy tenant will see the potential for their business to thrive with passing traffic giving exposure to new clientele. Featuring a showroom, workshop, storage, private amenities and 12 carparks this is a rare opportunity to secure a premise with so much on offer. Contact our marketing agents to arrange an inspection. 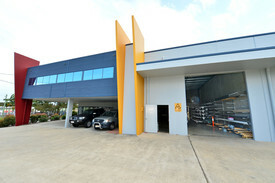 An opportunity to secure a premium industrial unit in the Noosa Auto Park area. The current occupants are Poolside Noosa who have been operating in Noosaville for ten plus years and have been in their current location for three years. The unit has been customised to suit their requirements and includes an innovative self service chlorine supply system, warehouse storage, office, employee kitchen and retail display areas. The large car park area allows for quick and easy access for clients and Poolside Noosa's service team. Other tenants include Fernwood Gym, Midson Constructions and Burson Automotive. + 369sq m plus 135sq m mezzanine plus 51sq m exclusive use outdoor area (sizes approx) + Property includes solar panel generated electricity + Tenanted by Poolside Noosa + Current rent $82,648 per annum + outgoings + GST + 5 + 5 year lease + Three exclusive use car parking spaces + 14 unit development with approximately 94 on site parking spaces Call or email Tracey Ryan or David Brinkley to inspect the property. Our team is strategically located in two offices across the Sunshine Coast region and is ready to handle your commercial, industrial and retail property needs today so call or email now. Well presented office warehouse of 174sq m (approx) ideally located just off Eumundi Noosa Road in the highly sought after Noosaville industrial precinct. + 174sq m (approx) office/warehouse + Two roller doors for easy access + Wide driveway with ample turning space + On site parking for four cars + Functional warehouse with solid mezzanine + Includes internal office, kitchenette and toilet + No GST payable with current owner Call or email Louisa Blennerhassett or Matt Marenko to inspect the property or find out about other suitable options. Our team is strategically located in two offices across the Sunshine Coast region and is ready to handle your commercial, industrial and retail property needs today so call or email now. An opportunity for an investor or perhaps an owner occupier who isn't quite ready to occupy their own space. This first floor strata titled commercial space provides flexibility for a buyer. Situated at the front of the popular Gibson Road showroom precinct this position can't be missed. 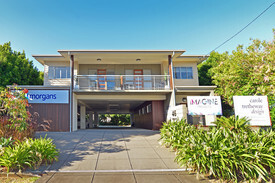 + 395sq m (approx) first floor strata titled tenancy + Long term tenant Sunshine Coast Martial Arts Karate Budokan International + Current income of $56,401.33 per annum + outgoings + GST + Lease term runs until end of December 2019 (no further option) + Current rental rate significantly below market expected rent revision upon lease expiry + Potential to split into two or more tenancies for future occupant flexibility + Large off street car parking area + Located at front of popular retail showroom complex which includes Harvey Norman, Gibsons Noosa, Townsend Family Dental, Bounce Hair salon Call or email David Brinkley to inspect the property or find out about other suitable options. Our team is strategically located in two offices across the Sunshine Coast region and is ready to handle your commercial, industrial and retail property needs today so call or email now. Positioned at the front of the four unit complex. Warehouse access is easy and exposure to the street provides good signage opportunities. Extra high clearance warehouse would suit window manufacturer or other business with long component parts. The office and showroom areas are well appointed with natural light into all spaces. + 580sq m industrial unit including 140sq m of mezzanine office and 100sq m open mezzanine (sizes approx) + Front unit provides excellent street exposure + Multiple offices all with ducted air conditioning, solar power to unit + Reception showroom area + High clearance warehouse and roller door + Seven off street car parking spaces (three undercover) Call or email Tracey Ryan or David Brinkley to inspect the property or find out about other suitable options. Our team is strategically located in two offices across the Sunshine Coast region and is ready to handle your commercial, industrial and retail property needs today so call or email now. Quality Industrial Unit In Elevated Position $1,250,000 + GST (if appl.. Positioned at the front of the four unit complex warehouse access is easy and exposure to the street provides good signage opportunities. Extra high clearance warehouse would suit window manufacturer or other business with long component parts. The office and showroom areas are well appointed with natural light into all spaces. Currently tenanted but could be made available within two months. + 480sq m industrial unit including 140sq m mezzanine office (sizes approx) + Front unit position provides excellent street exposure + Multiple offices all with ducted air conditioning + Reception showroom area + 20 kilowatt solar power with a 30 kilowatt board + High clearance warehouse and roller door + Seven off street car parking spaces (three undercover) Call or email Tracey Ryan or David Brinkley to inspect the property or find out about other suitable options. Our team is strategically located in two offices across the Sunshine Coast region and is ready to handle your commercial, industrial and retail property needs today so call or email now. 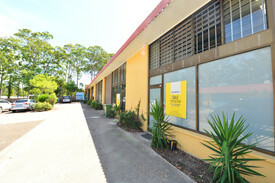 A single strata titled industrial unit within complex of five units with a good tenancy mix. Vehicle access to warehouse from Project Avenue is direct. Front office / showroom area is air conditioned and features windows allowing for good natural light. The property includes a kitchenette and shower. 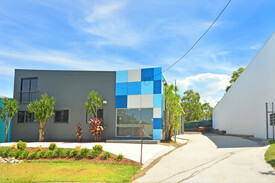 + 132sq m (approx) warehouse including air conditioned office / showroom + Current annual income $17,160 + outgoings + GST + Current lease term runs until July 2020 with further 1 year option to follow + High clearance roller door + Solar power + Amenities include a shower + Two allocated car parking spaces + Good exposure to Project Avenue Call or email Tracey Ryan or David Brinkley to inspect the property or find out about other suitable options. Our team is strategically located in two offices across the Sunshine Coast region and is ready to handle your commercial, industrial and retail property needs today so call or email now. Noosaville Freehold On Weyba Road $1,500,000 + GST (if appl..